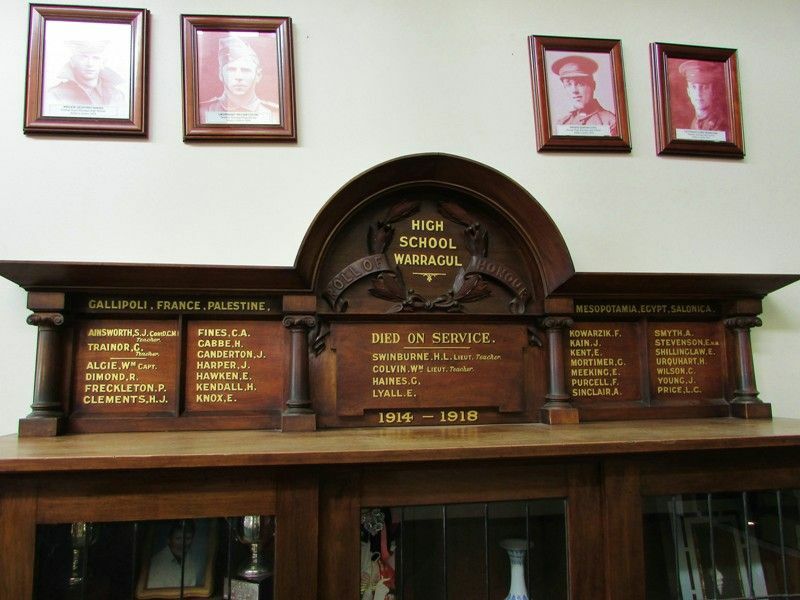 A wooden honour roll commemorates teachers and past pupils who served in World War One. Warragul High School had a memorable day on Friday last, when the Hon. G. H. Wise (Assistant Minister of Defence) and. the Hon. J. E. Mackey, Speaker of the Legislative Assembly, and Mrs. Mackey, and other visitors, including Mr. J. P. McLennan, formerly headmaster of the school, and now principal of the School of Horticulture, Burnley, came up to participate in the ceremonial of unveiling of the "Honor Roll." West Gippsland Gazette (Warragul), 27 May 1919.